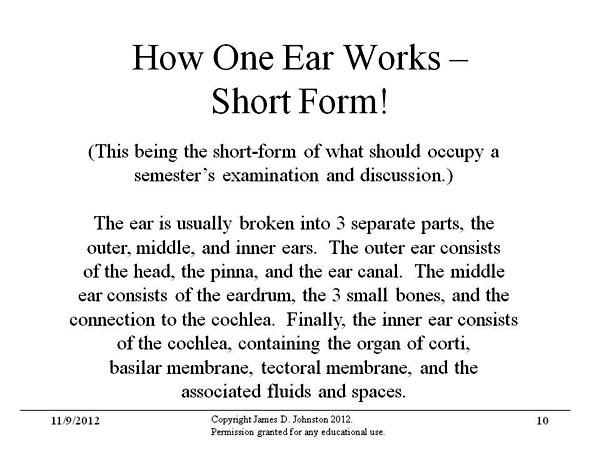 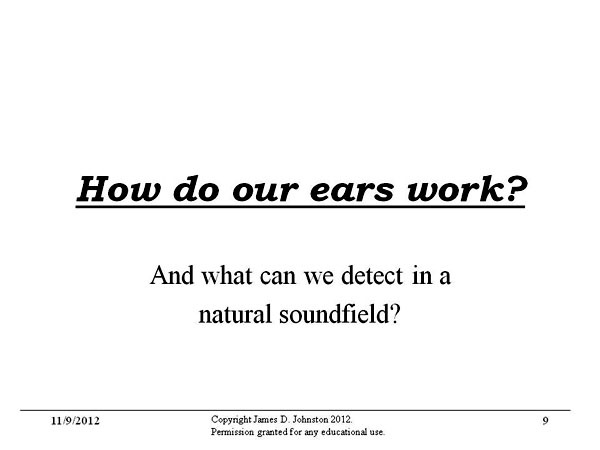 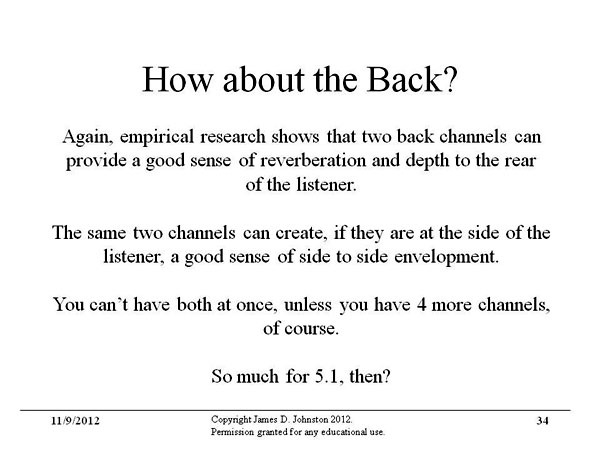 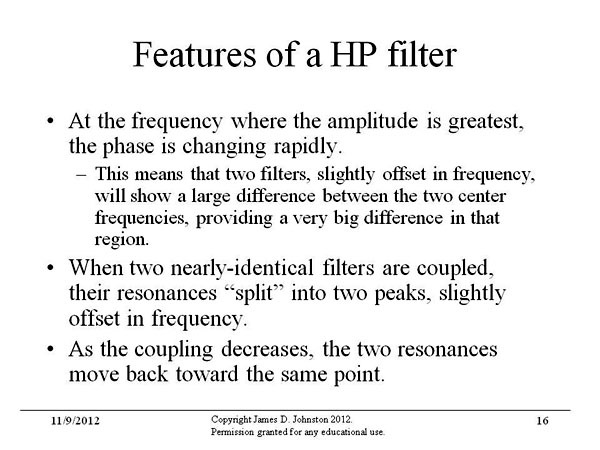 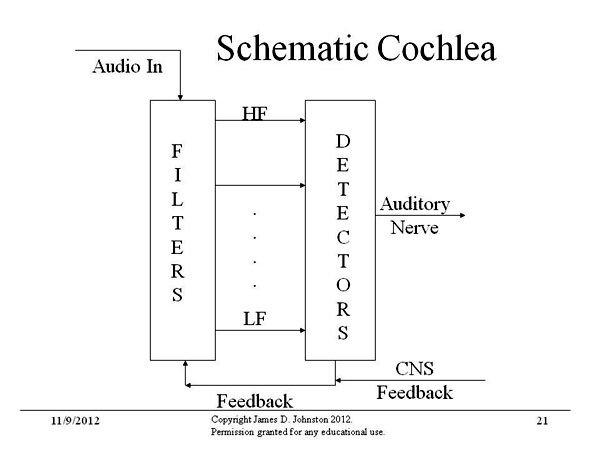 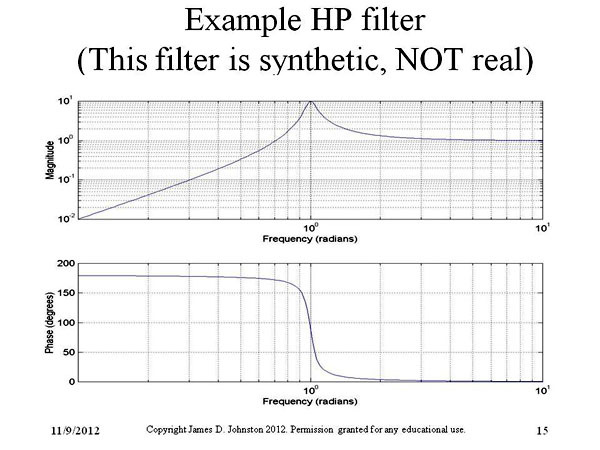 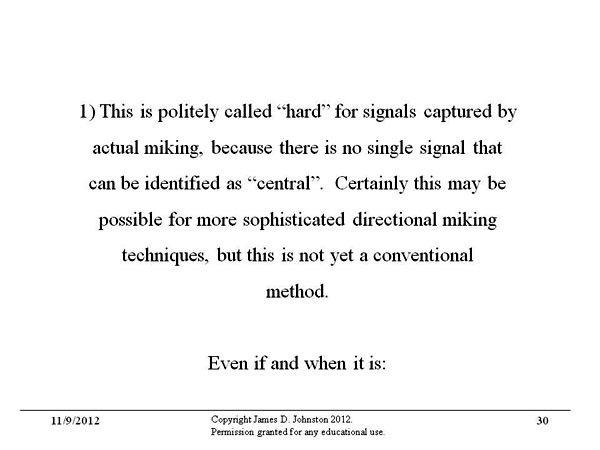 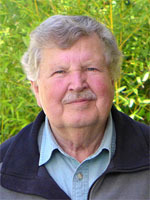 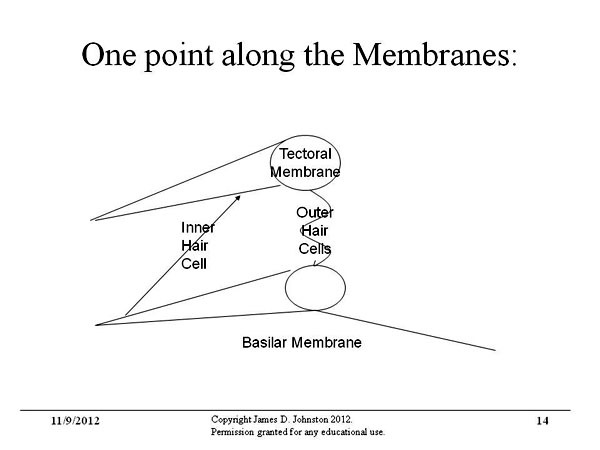 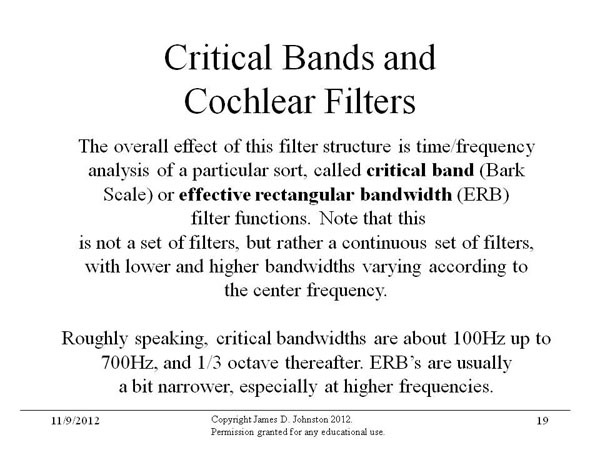 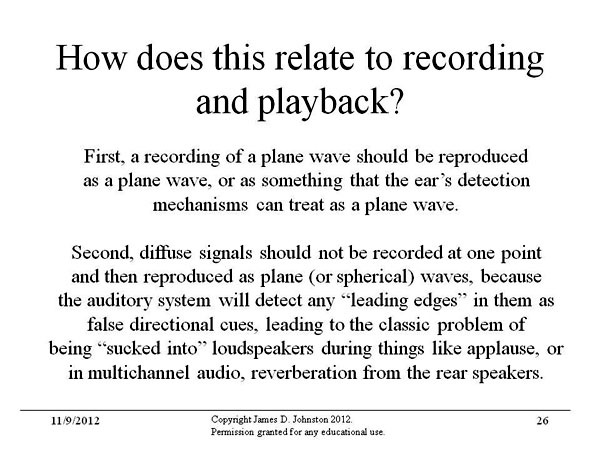 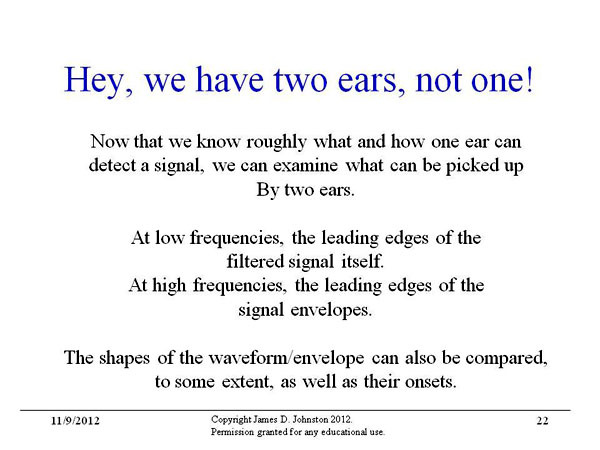 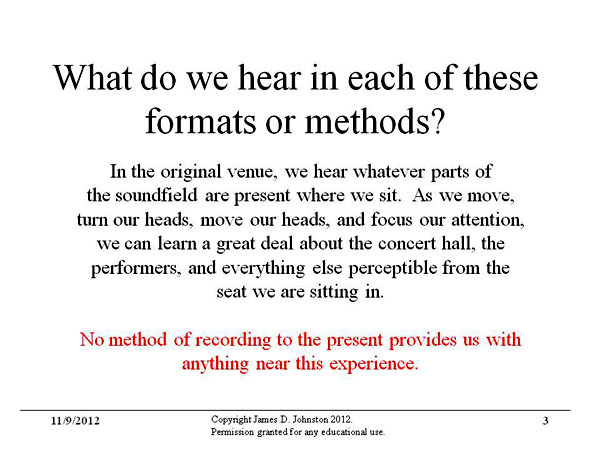 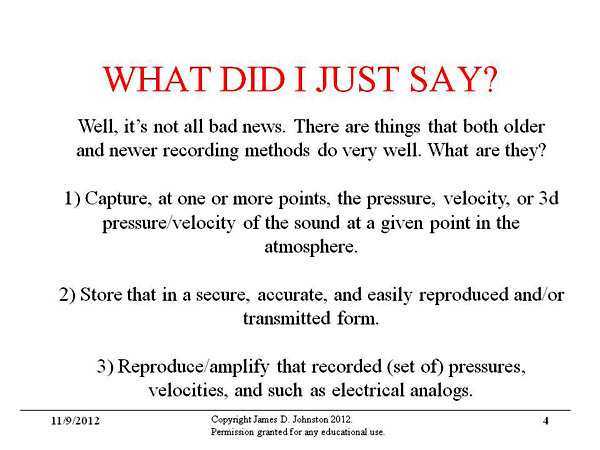 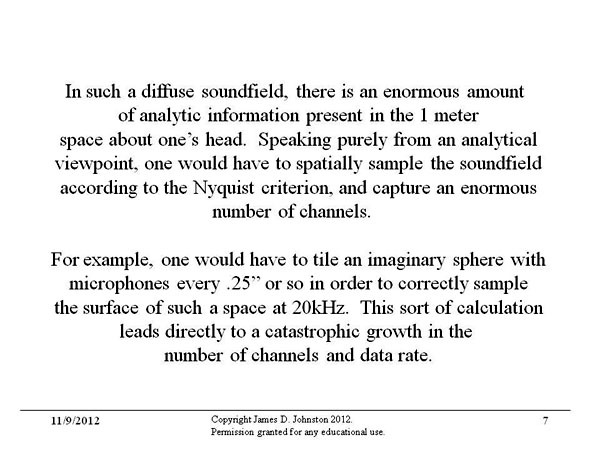 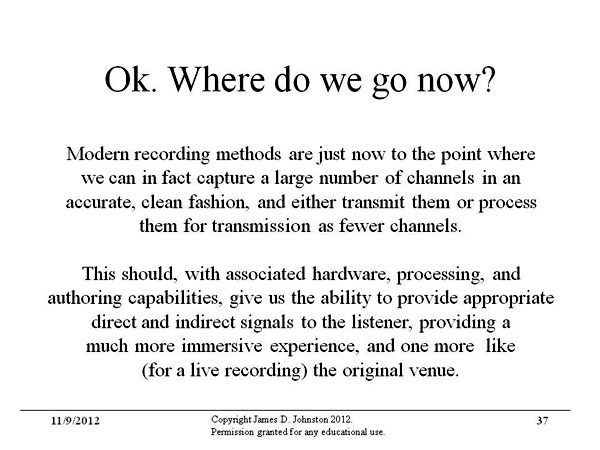 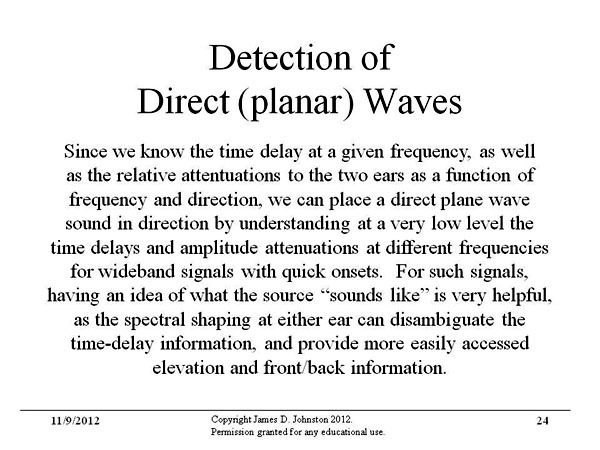 Here are slides from a seminar about acoustics and the perception of sound. 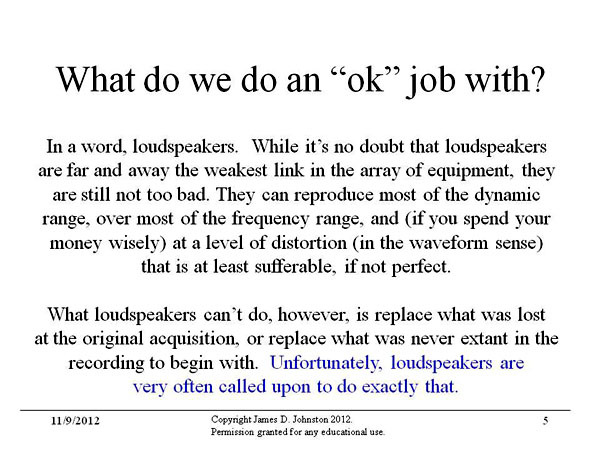 This subject matter should be of great interest to recording engineers and loudspeaker designers alike. 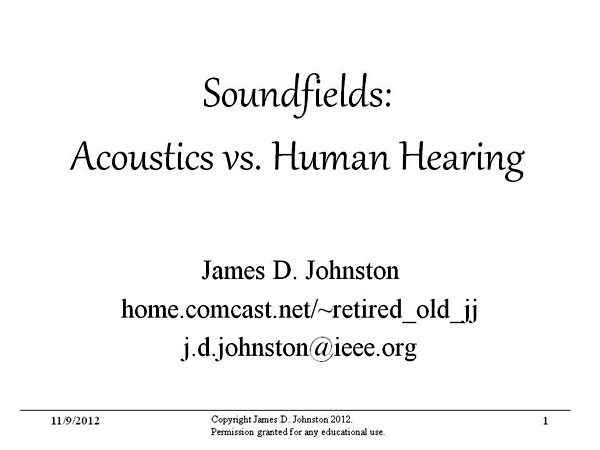 Both have a lot to learn about soundfields, how to sample them and how to render the recorded acoustic scene in a reverberant environment. 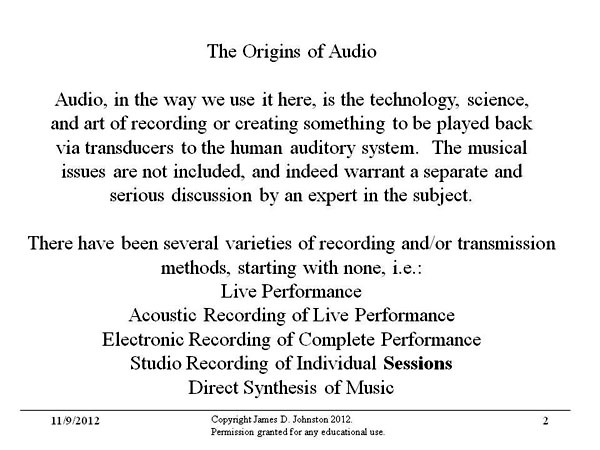 The science of this is not yet complete, but what is known should be taken into account in order to improve the art. 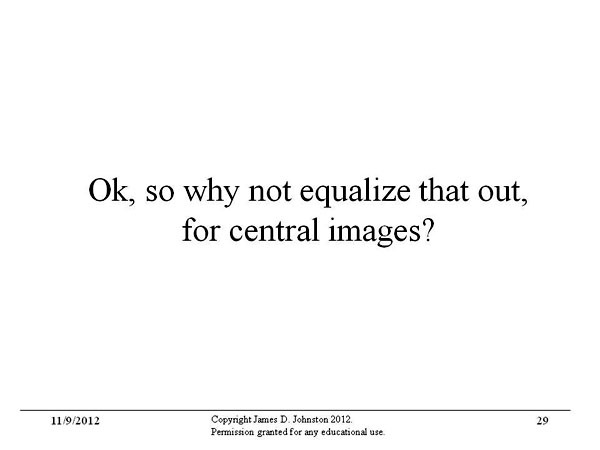 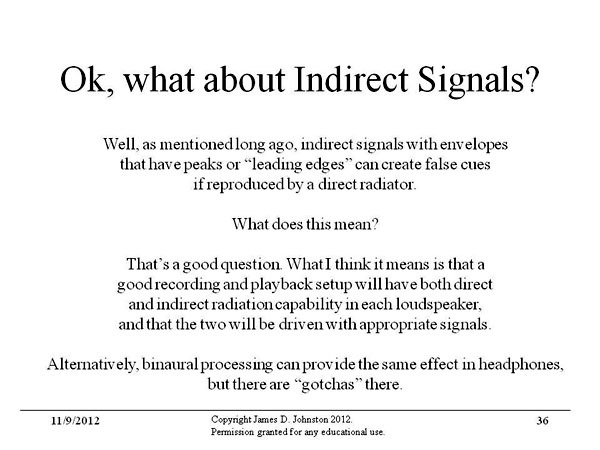 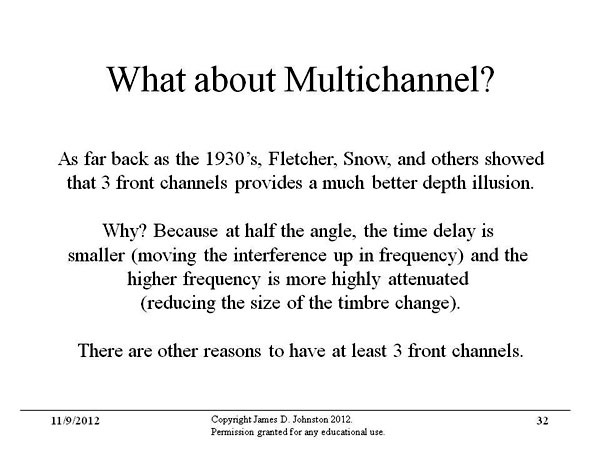 James Johnston (JJ) gave me permission to post his slides. 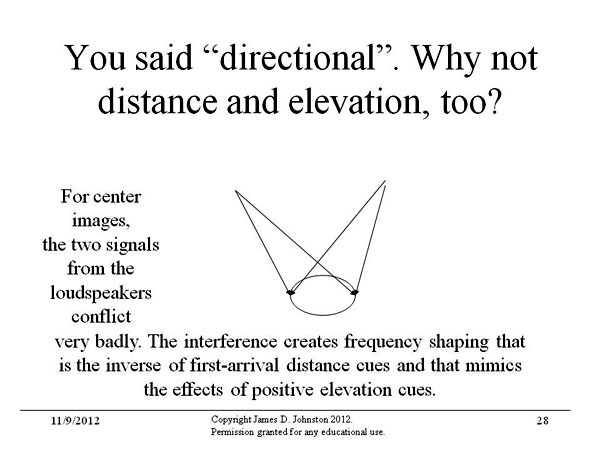 The on-axis free-field response must be perceptually dominant over the room response and it must be perceptually appropriately shaped for the intended angle of sound incidence, i. e differently for the Center speaker from Left or Right speakers and Surrounds. 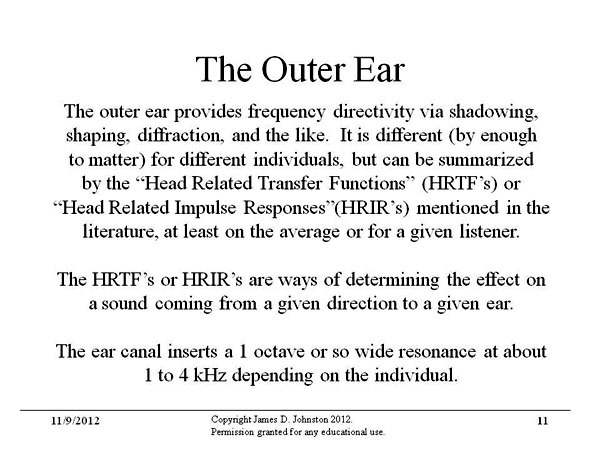 The Modulation Transfer Functions between loudspeakers and listener must be minimally degraded by the presence of the room. 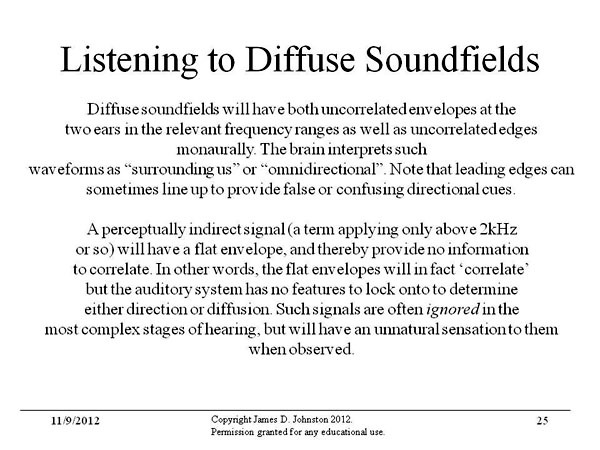 Most of the information for the brain is carried in the ever changing envelope of the signal, not in its steady-state behavior. 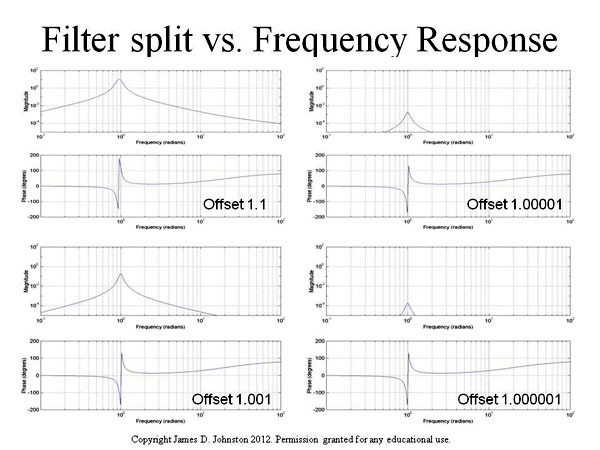 A Modulation Transfer Function can of course be calculated from the impulse response, but the perceptually significant modulation rate should be investigated first. 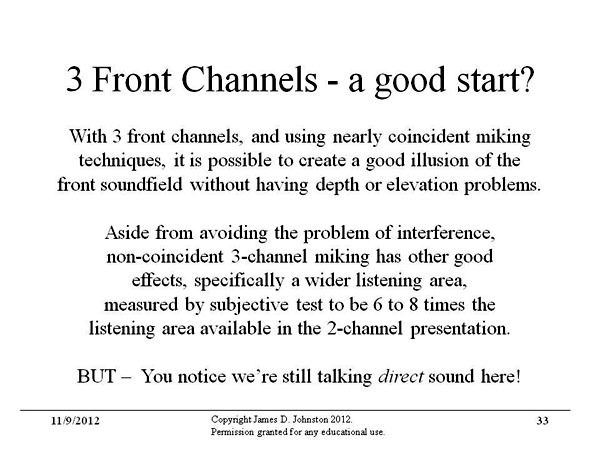 The first lateral reflections should not be intentionally diffused or absorbed, but delayed by at least 6 ms. 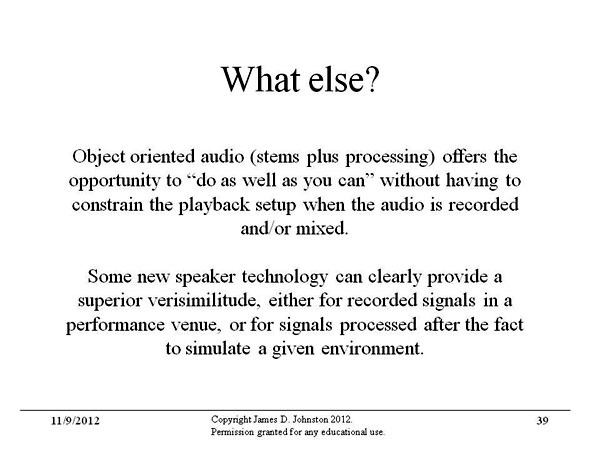 They are characteristics of the room. 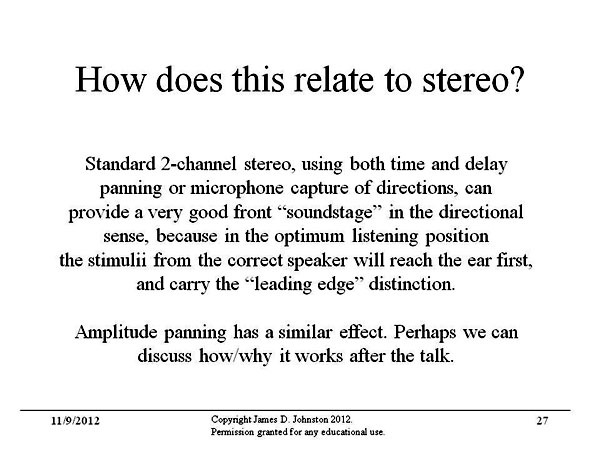 The reflections should be symmetrical in order not pull the phantom stereo scene to one side. 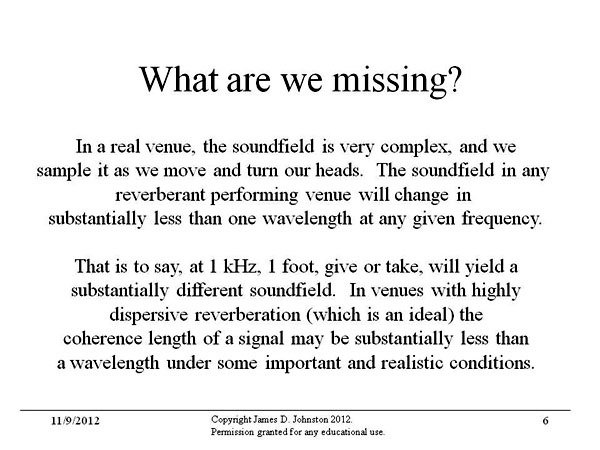 The sound spectrum radiated towards the first reflection area should be identical to the on-axis, free-field spectrum and only differ in amplitude. 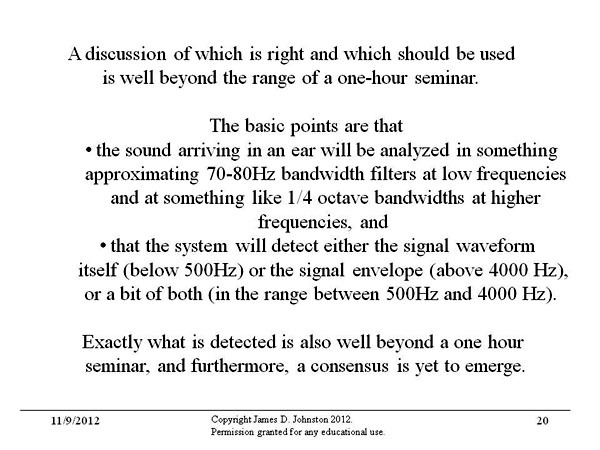 This requires a loudspeaker with frequency independent response over a wide emission angle. 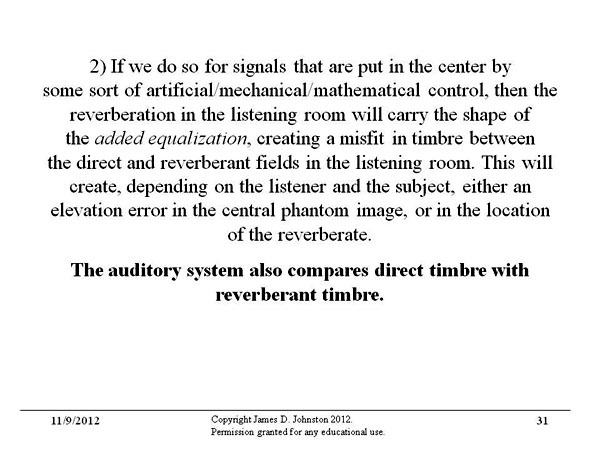 Floor and ceiling reflections are primarily associated with the perception of elevation of the acoustic source and with distance from it. 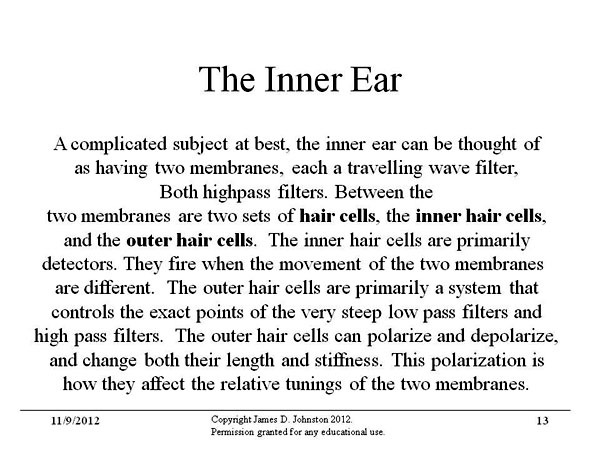 These type of reflections are experienced everyday and understood by the brain since childhood as belonging to the environment. 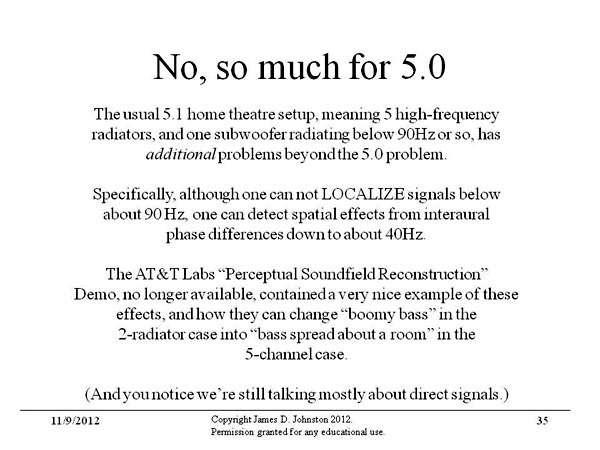 The reflections have minor influence upon the rendered phantom scene, but contribute to the reverberant field in the room. 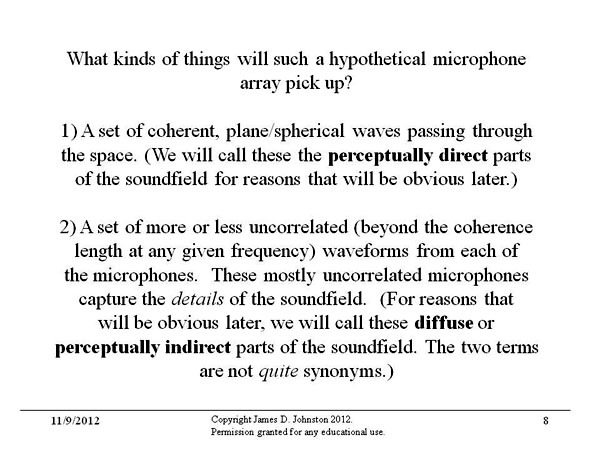 The power response of the loudspeaker should be frequency independent so that the reverberant field has the same timbre as the direct sound. 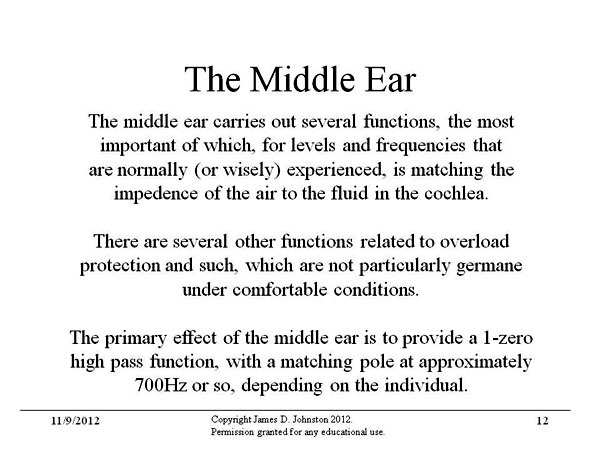 The direct sound at the listening position should be less than 6 dB below the reverberant sound above the Schroeder frequency. 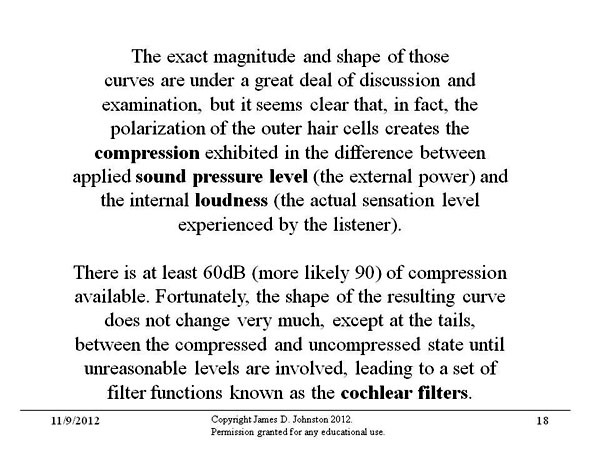 The wall behind the loudspeakers should be diffusive and the wall behind the listener should be absorptive or open for minimal reflection.